Maputo — The Kempton Park Magistrates Court in Johannesburg has delayed the hearing on the possible extradition to the United States of former Mozambican Finance Minister Manuel Chang until 5 February. 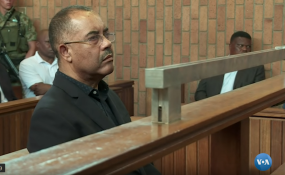 The hearing was due to resume on Friday, but the sudden decision of the Mozambican Attorney-General's Office (PGR) to seek Chang's extradition to Mozambique has complicated matters. Mozambique under the protocols of SADC (Southern African Development Community). The judge was not expecting this, and the Mozambican request has forced a postponement of the case for almost three weeks, to 5 February. J.J. du Toit, the South African Deputy Director of Public Prosecutions for the Johannesburg Area, confirmed that the Mozambican extradition request had arrived. The formal paperwork backing up the US request has yet to arrive - but the Americans have 60 days, dated from the arrest of Chang on 29 December, to submit it. Chang's defence team requested the postponement, which was supported by the prosecution and the judge. Technically, the Mozambican request is not for extradition (and indeed there is no extradition treaty between Mozambique and South Africa), but simply for Chang to be returned to stand trial in Mozambique. "It's not an extradition request as such", a source in the Mozambican Public Prosecutor's Office told the independent newssheet "Carta de Mocambique", adding "In our letter, we did not speak explicitly about extradition. We just said we wanted Chang to be tried in Maputo". A formal response to the Mozambican request is expected to be given by the South African Ministry of Justice and Constitutional Development. The Ministry must decide which of the two extradition requests takes precedence. One thing is certain - Chang will not be in New York next Tuesday, which is the date set for the start of the trial of the former minister and his co-accused in the case of Mozambique's "hidden debts". They face charges of conspiracy to commit money laundering, wire fraud and securities fraud, arising from the illicit loans of over two billion dollars that three fraudulent companies, Proindicus, Ematum (Mozambique Tuna Company) and MAM (Mozambique Asset Management), obtained from the banks Credit Suisse and VTB of Russia on the basis of guarantees signed by Chang. According to the US indictment, the companies were a racket right from the start and had nothing to do with their ostensible purposes of coastal protection and tuna fishing. Instead they were just a mechanism for illicit enrichment. In Maputo, Mozambican social media are expressing considerable scepticism about the PGR's request for Chang's extradition. For the PGR has a list of 18 names of people who could face criminal charges, most of whom are in Mozambique. As far as is known, none of them have yet been arrested or charged.